It’s a full Moon; Sun and Moon are on opposites sides of the chart, and as the Sun sets, the Moon rises. The Sun is in the fiery sign of Sagittarius. There is a strange mixture of kindness, curiosity and joyful optimism that sometimes flips and becomes fanaticism, and intolerance in Sagittarius. Perhaps this is because Jupiter, king of all the gods rules this sign, and like many monarchs, he is jolly until he is crossed. Meanwhile the Moon is in airy Gemini, lots of talk and the ever spinning brain. Gemini Moon can think her way out of emotional turmoil, but also needs to communicate feelings in order for them to be real. Mercury rules this sign and the ‘jazziness’ of energy which he creates is often poured into multi tasking, non stop talking, and feverish excitement until exhaustion sets in. Yet there is a deep resilience and renewal to this Moon sign! Mercury and Jupiter are very different gods…Jupiter is the king, Mercury his servant messenger, but like many servants, he has a kind of freedom forbidden to monarchs. Jupiter is known for his stormy marriage to Juno and endless sexual conquests of mortals and gods. Mercury is more androgynous. He is also promiscuous, and some say he has a daughter with Venus, but no marriage for him! Notice his floppy hat! With each full Moon we have the opportunity to integrate opposite signs, and to bridge our understanding of polarity. We all contain these contradictions and instead of trying to repress one side or another, the full Moon says: embrace it all, and create a dance of the whole mess! There is another opposition in this chart as well. This is one I would call the Odin pattern. Uranus and his companions Eris (chaos) and Ceres look across the chart to Jupiter. Like the Sun and Moon they are in signs of Fire and Air. Odin, like Uranus is not about established tribal order, but more about the new ways. 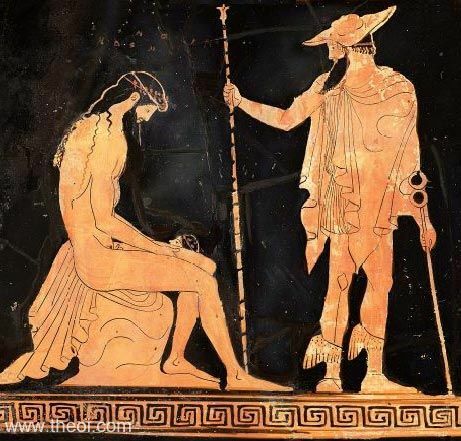 He is known as the ‘Wanderer.’ He wears a floppy hat, like Mercury and is missing one eye, which he surrendered in order to acquire deep wisdom. Like all interesting gods, he is full of contradiction. His name can be translated as ‘Master of Ecstasy.’ He is concerned with war, wisdom, magic, shamanism, poetry and the dead. His gift is the Runes, a magical alphabet. . His connection to Uranus in Aries makes him much like Prometheus, who brought fire to humanity. Jupiter is in Libra at this time. Uranus and the gang are in Aries, another god of war. Jupiter in Libra suggests a deep concern with law and order. But Uranus suggests upheaval and anger. The Shamanic process of Death, Purification and Renewal are Odin’s qualities and indicated in this full Moon chart. The theme of Odin continues. Mercury and Pluto square this Uranus/Jupiter opposition, further emphasis on the Death (Pluto) and poetry (Mercury) aspect of Odin’s character. Here he is at Standing Rock, walking the battlefield as he was known to do. That battle is far from over, and most of us expect further conflicts between the people’s forces of Uranus/Eris/Ceres and the power of big business (Jupiter). Pluto is associated with oil, and he and Mercury are in the sign of Capricorn, government and corporations. The T-square in this chart opens out to the sign of Cancer, the sign of home, the wisdom of the Moon, the emotional tides. Here we may find the healing we need, the wisdom Odin found when he hung from the World Tree, Yggdrasil, where the Runes are carved. He pierced himself with his spear, and gazed into the Well of Urd, from which Yggdrasil grows and he learned the secret of the Runes. He says: “given to Odin, myself to myself.” This might be the medicine we need at this time, the ability to give away ego, in order to learn a new medicine for the World. Here is Odin on his eight legged horse, Sleipnir. He carries his sword, Gugnir and is accompanied by his ravens: Huginn and Muninn. He had the power to bind and unbind the human mind, symbolized in the interlocking triangles called Valknut. Like the astrology chart, this is the eternal movement of the Universe. Aquarius is a constellation in the zodiac with two ‘rulers, ‘ Saturn and Uranus. Both are very active in this chart. Rulers give a clue as to the nature of the energy for the signs. Aquarius has a Saturnic, i.e., manifesting talent, but unlike the previous sign, Capricorn, also ‘ruled’ by Saturn, Aquarius is more likely to create something in a new way or new realm. Saturn, as ruler of Aquarius is influenced by the quirky and revolutionary nature of Uranus. He’s not his Capricorn solid and traditional self. It’s as true with planets as it is with humans that our companions change our rhythms viewpoint. Saturn in the chart for this new Moon is working in Sagittarius and makes a sextile to the luminaries (Sun and Moon). He is watching them from a Sagittarian vantage point, perhaps suggesting that this is a time for asking what we carry as belief. When our beliefs become too Saturnic our life can turn into a burden of responsibility and ‘shoulds.’ We can no longer see any potential for new perceptions. The IX of Wands has a picture of this state of affairs. This man has successfully fought off all attacks and has neatly arranged the trophies of his victories in a protective wall around him. Yet the protective wands keep out friends as well as enemies. He is waiting for the next attack, rather than looking for new possibilities. He might need to add some of the hospitable warmth of the IX of Cups to his expectations. Maybe we could all learn to forget the source of our bruises and focus on generosity at this new Moon. Uranus is also making a friendly sextile to Sun and Moon. This means Saturn and Uranus, the planetary rulers of Aquarius are in trine; they share the Fire element, but express it quite differently. Fire from the Jungian point of view is the element of intuition. It jumps from place to place, and cannot be contained. Uranus goads the new Moon (and the Sun) to put some passion into those Sagittarian beliefs Saturn is channeling for us. The Star, is the Tarot Card associated with Aquarius. This collage version is from the Voyager deck by James Wanless. Aquarius is the sign of a universal or group kindness. There a promise of great healing in this moment of the new Moon in Aquarius. Jupiter and Chiron are in opposition across the Lunar Nodes’ axis. Each of us has the opportunity to find a place to offer kindness to a world in pain. Kuan Yin is the light within, the source of universal compassion. Saturday the full Moon in Leo will offer us another pair of contradictory impulses, we each struggle to integrate. The Moon in Leo urges us to develop our powers of self expression, to gird our self in courage, and to sing a song of our own creation. Pride and warm feelings for others mingle in the heart of the Moon as she rises skyward to shine on us all. A Leo Moon is all fire and theater, and we may feel a drive to sing in the moonlight! The Aquarian Sun sees this precious moment from another point of view. Creative energy finds an outlet in creating a better society for all of humanity. Aquarian energy is often eccentric and ‘far out,’ even while trying very hard to make things better for everyone, because there is a natural tendency to live in a vision of the future. Aquarius is an air sign; a place of mental chatter with an intellectual’s drive to find out what is ‘the truth’. His Moon is in the opposite sign of Leo, “Do anything, but let it produce joy.” And, “That you are here—that life exists, and identity; that the powerful play goes on, and you will contribute a verse.” He gives us clues, so many, as to how to integrate Leonic and Aquarian impulses, and celebrate both ends of this full Moon event. The Leo Moon gets a large dose of energy from a sextile between Venus and Neptune. These two make a bracket around the Aquarian Sun and release their energy from a Yod to the Moon. A Yod is an astrological relationship between planets, which takes difficult relationships to a new level of creative understanding. Neptune is sometimes called the higher octave of Venus; despite this cold weather outside in the Northern Hemisphere, this full Moon is all about love, love, love! So the Two: Venus who has just entered earthy practical Capricorn, and Neptune who is fully manifest in the sign of mystical, watery Pisces, bracket the Sun likes arms of a lover. Whoosh goes their energy into the highflying Leo Moon! “Houses and rooms are full of perfumes, the shelves are crowded with perfumes, /I breathe the fragrance myself and know it and like it/ The distillation would intoxicate me also, but I shall not let it. “ Walt again. Neptune can be a place of illusion and addiction in the chart when he is not fully realized as an invitation to the deepest and highest form of universal love. she takes it in silence. as a full and flying moon. As I write this, the waning Birch Moon is slipping away and a new Moon of Rowan is about to be born. This new Moon will teach us how to dance to earthy Capricorn. Sun, Moon, Pluto, Mercury and the asteroid Pallas Athena are visiting this sign, which is not noted for fun, but rather for structural concerns, although careful craftsmanship can be also be fun. Yet if we don’t see and feel the dance of Capricorn’s materialization, our world collapses around us. We are stuck in ‘what was’ and forget to hear the rhythm of the present and the siren song of the future. an astrology chart often indicate an artist (Venus) willing to take part in the hard work and the hours (Saturn) necessary for success. And look at this: the Tarot card for Saturn is The World card….she who dances eternally to keep the Universe in movement! But wait, the dancer is not ‘she’; this is an Edwardian version of a hermaphrodite, a mixture of male and female in one body. This is the final card in the Major Arcana, and hints at the work of the Magician, which must include a sacred marriage between the sexes in one human. Like The Magician card, the dancer carries yarrow sticks….the communication device between spirit and oracle. This is how the Delphic soothsayer received the word from the gods, through yarrow sticks. These were the original I Ching prognosticators. Listen carefully for the word that comes to you from simple sources. This new Moon is the first of the New Year 2016. Capricorn gives us the strength to carry out goals we have identified as we entered 2016. The tradition of setting New Year resolutions makes sense in the spirit of Capricorn Sun and Moon, which are always present at this time of year. It is taking the tide to begin a journey by sea. The Venus Saturn conjunction adds a extra note of potential for each of us to create something tangible. Give yourself some time alone, in nature, in the dark of this dark season to see what is the next step in your soul’s journey. Mercury is taking this time to retrograde back into Capricorn from a momentary journey into Aquarius…a sign of the future, while Capricorn would like us to be well seated in the present. Give yourself some retrograde permission to revisit your most heartfelt goals for the future. The Sagittarian couple, Venus and Saturn will help you. Saturn in Sagittarius will help you (and me) establish ambitious goals based on our deepest held values. You can see how this can work for good and misery. It’s important not to identify self existence with beliefs and goals, which can shift and change. But there’s a necessity for focus that eludes many. This is a moment of focus, Capricorn, Saturnic, Venusian focus. Uranus and Pluto continue their grinding square only one degree off from each other. They offer us the chance to integrate two positions in the realm of transformation. Pluto is very tightly associated with the Sun and Moon giving them (and us) the power to be true to our highest intentions. Uranus demands we communicate our own story beyond the old forms we have tried before. What way will you create something that breaks out of the molds you use over and over? How do we know when our interaction with the material world harms or renews the earth? Perhaps by fully identifying with the earth as earth beings we will gain the consciousness to know how to build in harmony. 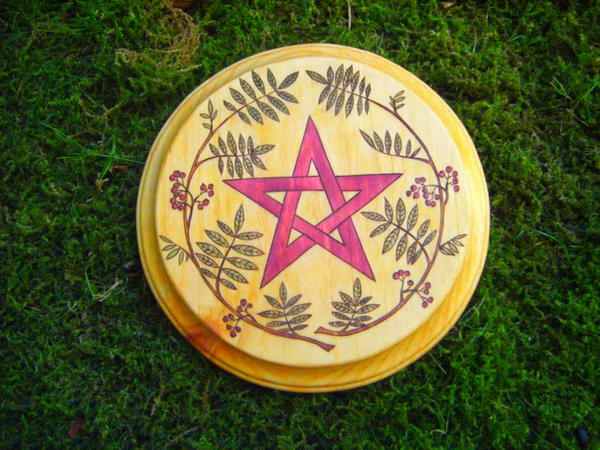 Now we enter the new Moon cycle of the Rowan whose symbol is the pentacle found at the bottom of the Rowan berry. A Big Moon for Christmas Eve! The full Moon in Cancer of December 25, will fill the sky on Christmas Eve, and be exact at 6:11 am EST on Christmas Day. She is in her most comfortable sign, oceanic, while dedicated to home; moody, yet focused on feelings of maternal compassion. Cancer Moon vibrates to ancient cycles, and still hears the ancestral lunar wisdom. This particular Moon Lady holds a crescent Moon in the form of a bison horn. Taurus, the Bison, is the Moon’s sign of exaltation. Scratched on the horn/crescent she holds are thirteen lines for the number of lunar cycles in a year. This is a reminder that the Moon is the calendar. This delight in the Moon and her cycle continued into Christian times, but the Moon lady now wears clothes…..and always seems to be shown standing on the Moon, as if to over come lunar power. Snakes are wrapped around the crescent in this painting to warn of the danger of the Moon’s power. The Tarot card which corresponds to the Moon is pictured in this same way, with the crescent Moon underfoot. Yet this card is symbolic of the reserves of ancestral wisdom available to those who follow the Moon’s course..
What was it like when the Moon was fully expressed in the stone age world and the female body? What does it mean for feminine energy to be constricted into purity rather than overflowing with fertility, creativity, abundance? Cancer is deeply invested in finding the right moment for the right action. After all, the Moon is the first timepiece. With the Cancer full Moon opposite the Capricorn Sun, we have the opportunity to feel the rhythm of our life in the here and now (Cancer), connected to earthy Capricorn’s intuitive knowledge of how to create what we know comes next. During the quiet time that follows the Solstice, and the full Moon excitement of Christmas, we all get some space for contemplation. Do we like what we are constructing (Capricorn Sun)? Does it feel as if our life expresses some special task or responsibility, unique to ourselves and in alignment with the tides (Cancer Moon)? ‘Tell me, what else should I have done? with your one wild and precious life?’ The Summer Day. We are living in a time of tension, a reflection of the Uranus Pluto square. On Christmas Day, the planet Uranus stands direct after many months of retrograde motion. The pressure of this combination continues to be felt, much like being caught between a huge argument by angry giants. Yet this often gives the hero in fairy tales, the opportunity to run off with the treasure, so we must find the opportunity in these tumultuous times to find a new way under the noses of the angry giants who tell us there is only one right way. Uranus is in Aries, the sign of the rebel warrior, Pluto, like the Sun, is in Capricorn, and is pointing out the flaws in the construction of business and government. Sometimes it is easier to be destructive than constructive. Perhaps it’s actually part of the plan like the waxing and waning Moon. Enjoy this full Moon. It comes at a time of change, the world over, as we experience the return of light or the diminishment of the day. Jupiter and Venus are in sextile so we are showered with generosity in a season dedicated to generosity. Don’t be afraid to enjoy the largesse! Here are two little musicians to play dance music for you! One plays the flute, the other a clarinet. blinded by the down pour. Dawn on the first day of Return. face averted from the icy blast. The sea and the shore are one. to declare winter shall begin.